This morning went great! Unbelievable. I can not believe how ready Iris was to be adopted. She didn’t cry and was down right silly. She LOVES Jon. See enjoys us all, but it seems as if he is the most exciting for her. Either we say her Chinese name wrong, or she just chooses to ignore us. I’m thinking the latter. She loves the I-pad, naturally. Apparently 6 year old kids nap in China. Our guide told us to put her down for a nap from 12-2. Ok.
She pushes the buttons on everything. Exactly like Mesfin did….oh wait, I mean still does. She has shared everything so far. Very cute. And likes to feed us all. Funny. It took her under 6 seconds to figure out how to take pictures on the I-phone. Her orphanage was fantastic. Really. Granted, not better than a family, but so wonderful. She has a backpack of personal belongings. Also, they give the kids an allowance starting at 5 years old, then they take them shopping to buy things with their money in order to teach them saving and spending. She actually knows some English. Some words not so useful such as teddybear for all stuffed animals and bananas. But she has learned how to count to 5 in English and say things like sorry and thank you very much. 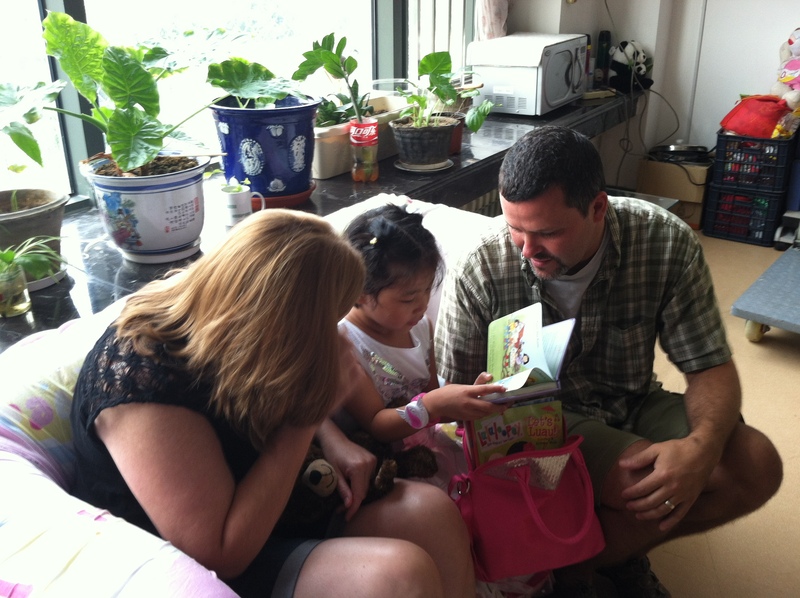 She can read well in Chinese too, according to our guide. So much more to discover about this little girl. On another note, the mongolian beef in China is not so good. 🙂 And serving it with the actual bone in the bowl….. well, I’m thinking it doesn’t add that much flavor. Jon is trying to talk me into McDonalds. Wow, congrats to you all on the addition to your family…I admire your faith and commitment and, I’m sure she will be a blessing to all. You are all truly blessed especially Iris. The Brunings can’t wait to meet her.